April is National Autism Awareness Month – a time meant to improve awareness and acceptance of autism and draw attention to the tens of thousands of people diagnosed with autism spectrum disorder (ASD) each year. 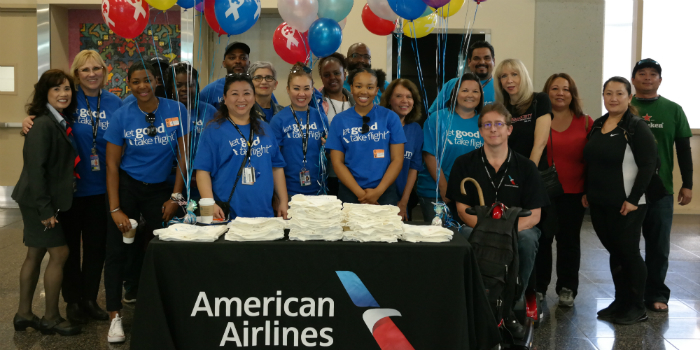 That’s why the Envoy and American teams in San Diego (SAN), in partnership with the Autism Society of San Diego hosted a “Cool to Fly American” event last week. Cool to Fly American events help customers with autistic family members practice and prepare for air travel by hosting mock flights using real aircraft, agents and crewmembers. The experience provides employees, families and customers with a supportive atmosphere to discover how their loved one may react to the unique stresses and procedures of air travel. “This was a great experience for everyone, and we all learned a lot” said SAN Envoy Lead Agent, Hellen Tran. “Thank you to everyone who volunteered their time to support this important event.” Way to go, team SAN!